Bundesliga Daily rounds up all you need to know from Germany's 18 top-flight clubs. On 15 July, the new match ball for the upcoming Bundesliga season was unveiled, Germany announced their squad for the 2016 Olympic Games and David Alaba returned to training at Bayern, who had NFL star Odell Beckham Jr. in their midst. 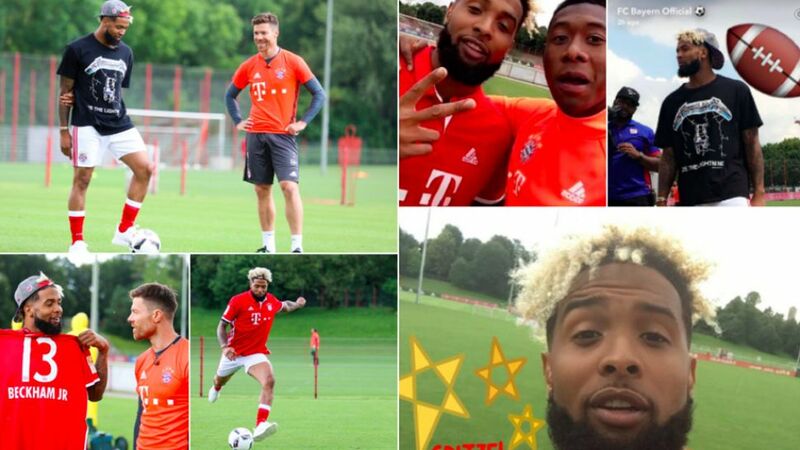 Reigning Bundesliga champions FC Bayern München were honoured by the presence of a special guest at their Säbener Strasse training complex in southern Munich today as NFL superstar Odell Beckham Jr. paid them a visit and even donned the famous red jersey! Indeed Beckham Jr. caused a stir when he left the training ground too. This was the scene when he took a stroll along Marienplatz in Munich city centre, where he was mobbed by hundreds of fanatical supporters, who ended up chanting his name. Scenes! Bayern defender David Alaba is back in training after enjoying an extended holiday following Austria's exertions at UEFA EURO 2016. The vast majority of the 18 top-flight sides have shown off their new attire for the 2016/17 season. Check them out in our XXL gallery! 1. FC Köln have returned home from Austria following their first training camp of the summer, although they will be returning to the Alpine nation in two weeks for a second camp as the Billy Goats ramp up preparations ahead of the new season. Marco Reus may have missed UEFA EURO 2016 with a groin injury but you can still help make his summer one to remember by voting for him to be the global cover star for EA SPORTS' FIFA 17 game. Head here to cast your vote! Germany's Olympic squad was not the only big announcement today, as the new adidas TORFABRIK match ball to be used in the 2016/17 Bundesliga season was revealed. Check out its comic book-inspired design right here. Die Nationalmannschaft have sent out a strong statement of their intent at the 2016 Olympic Games in Rio de Janeiro by revealing a formidable 18-man squad including brothers Sven and Lars Bender, Julian Brandt and Max Meyer, among others. Being in Brazil will bring back fond memories for one member of the ensemble in particular: Borussia Dortmund's Matthias Ginter, who was part of Germany's triumphant World Cup side in 2014.